We stock Franklin Electric and Grundfos pumps from ½ hp to 3 hp. We also stock Well X-Trol pressure tanks of all sizes. We have access to a large assortment of well pumps and tanks and have 5 DNR certified people on staff to install a new or repair your old water system. Nobody wants to have well problems or find out they don’t have any water. If you ever do, we can help. We also have water treatment specialists on staff for help with water issues of staining, being corrosive or acidic, and odor issues. These issues are all common in wells in Jackson, Clark, and Monroe Counties. We have many water treatment systems installed, in which we can service, have parts, installed now. We use the highest quality equipment for Water Right. 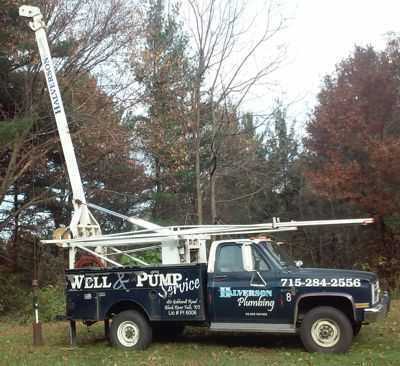 Page Summary: Halverson Plumbing offers water pump, water well, well pump and water pressure tank. Services such as pressure tank, well service, shallow well pump as well as submersible well pump are also part of the scope of our business. We also specialize in pressure tank for well, water pressure pump in Neillsville, Tomah, La Crosse as well as Pittsville. Other areas we serve include West Salem, Sparta, Black River Falls and Osseo. We also service Holmen, Onalaska and beyond.